The recent college admissions scandal has taken the news by storm and raised many questions about how admissions officers make decisions when selecting students for their universities. We talked to Susan Shifflett, one of our Former Admissions Officers from Yale, about her experience reading applications. She was featured on Good Morning America, ABC News, and Off Script on CBS to provide her perspective on the scandal. 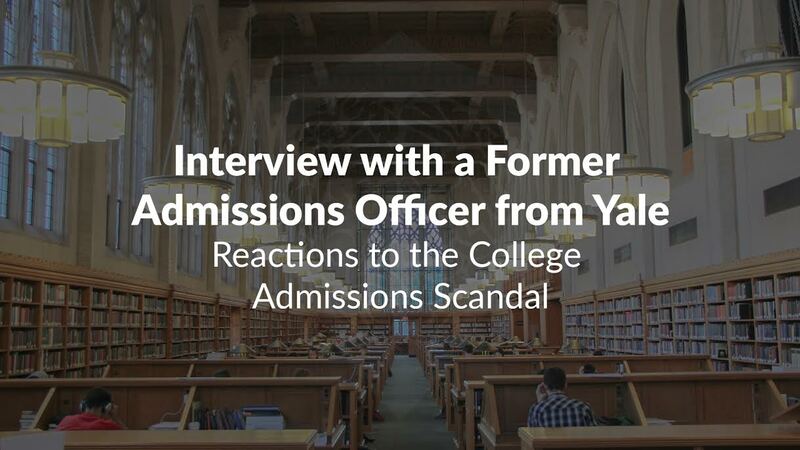 In the interview below, Susan explains exactly what factors into application decisions and how she sees the scandal affecting the future of college admissions. What are your initial thoughts on the college admissions scandal that has unfolded this past week? Susan: It’s very unfortunate and shocking. I think it’s certainly not the sort of story we want to hear out of colleges. What do you think is the most surprising part of the scandal based on your experience reading applications as a Former Admissions Officer from Yale? Susan: I think from my perspective, the most surprising aspect is definitely how the athletics process was basically adulterated. The testing portion - it’s very unfortunate - but it’s something where there’s always been some level of awareness that that’s a possibility and increasingly, we’re seeing that schools are taking test scores with a grain of salt. But the athletics, getting a list of recruited athletes when I was at Yale, that was something I always took at face value because I was looking at the coaches or the athletics department to tell me what’s an institutional priority. For instance, if the crew team coach says, we need X person or Y person, I have no reason to believe otherwise. I don’t know if you need another coxswain or if you need another rower. Or the sailing team - I don’t know anything about sailing. So, I look at the list, and you’re basically flagging for me that this is an institutional priority. I would never have imagined that is something we would have to call into question. How were applications read at Yale and athletic applications specifically? Susan: At Yale, and I would say at most selective similar schools, applications are read geographically. I would cover the northern California region, which meant that I read all the applications from northern California. The reason the admissions offices like to do this is because it allows the admissions officer to dive deep and get a sense of that area and understand the context. Of course, you can’t know everything, but to understand at best what the context is that your applicants are coming from. From there, at least when I was at Yale, I would do a first read. There would be a first read, there would also be a second read, and there would be rankings that we would tag that were associated with extracurriculars, your academics, and your overall rating. Then towards the end of the admissions season, we would go into a committee which really could range from just a few people to upwards of say, roughly a dozen. That admissions committee is comprised of the admissions officers, more senior admissions officers, sometimes we’d bring in staff or professors. We would go through the list of applicants in the admission officers’ area and present the candidates we thought had a strong chance of getting in. While the admissions committee does see the numbers and rankings of all the different applicants, for the most part we would present in detail the kids that we thought had a good shot of being admitted. We would take a vote at the end whether a student should be admitted or not. That’s the overall process. In terms of athletes, what would happen is that we would get a list from the athletics department that the coach had put forward for their team. If, for instance, the soccer coach put forward a list of candidates, they would be in somewhat of a ranked order. Let’s say Sally is a top priority. Let’s say Kristen is also a top priority. I would look at the application and know - okay, this is a top priority for the school. So that is highly weighted into consideration. If the student is very highly ranked and meets our basic criteria of a student who can handle the academics at Yale, most likely they would be admitted. Of course, the higher you are on the list, the better. I know you mentioned that test scores are often taken with a grain of salt and that changes have already happened with how test scores are considered. Do you think there will be more changes in how test scores are valued in the admissions process in light of what has happened? Susan: The overall trend, like you mentioned, is increasingly there is going to be less weight on the test scores at least at elite schools, such as Yale. Whether this unfortunate scandal accelerates this trend...potentially it reaffirms the trend that universities realize, that look, a test score is how a student performs on a test. It is not directly indicative of their academic or intellectual ability. Not to mention that some students spend time with independent test prep companies, some students take it multiple times, and your performance on a test is just one given day. Overall, there’s so much weight on a transcript that gives an admissions officer much better understanding of how you do consistently on an academic level and how you perform in a classroom discussion, and we get that through teacher recommendations. Walk us through “the back door” - how are special cases or development cases considered? Susan: There’s been a lot of conversation with the Singer scandal about the open door and the back door and the side door. From what’s been reported, essentially what he was selling was this idea of a side door. The open door is ideally what we all hope for: that you’re admitted purely on a meritocratic basis. Then, the back door was in the cases where applicants’ parents or relatives contribute a very significant financial donation to the school. Sometimes they’re buying a building and what not. We would get a list at Yale at the time I was there where we’d get a flag - okay these applicants are high institutional priority to the development office. I wouldn’t get the specifics of X or Y or Z, but you just know one high possibility is that somebody in their family donated a very significant amount of funds. What Singer was saying was that the back door, yes you can get in that way, but there is no guarantee because at the end of the day, whether it is through athletics or the [development] office, the student still has to meet sort of the basic admissibility academically. What he was saying about the side door was that there is a way he claimed that he could guarantee that your student could get in and he did that through doctoring the athletics list, and of course with the testing. So definitely the less scrupulous means. How was legacy factored in during your time in admissions? Do you expect this to change in the future? Susan: Undoubtedly in these kinds of conversations, legacy comes up, and legacy is not an advantage as much as most people think. It’s significantly less than when we would get the development list or the athletics list. I would say maybe if you had two applicants of equal strength, certainly the legacy could give you a tiny bump, but it is not nearly the significance of being on the development list or being on the athletics list. It just is not nearly as large a bump as most people think. Legacy applicants really have to be able to completely stand on their own. Certainly the legacy can be helpful but in and of itself, it’s not - we wouldn’t take a student that could not handle the academics or did not shine just because they had family that had attended the school before. Every applicant is different, and the range of assistance they each receive along the way varies in both intent and palatableness. Some kids grow up in better schools districts. Some kids have access to extracurricular opportunities. Some have private tutors. Where should we draw the line in admissions? How can we make the process more fair? Susan: I think it’s hard, and there is no silver bullet. On the one hand, you have schools - some state schools for instance - where your admittance for the most part is really based off of your GPA or equivalent and your test scores. Or the other end of the spectrum, where you have much more of a holistic admissions process. I think some people are going to think one way is more fair than the other. I think for me, it is really hard because in a holistic admissions process, working in admissions at Yale, it is a subjective process. I don’t know that it can ever be 100% completely fair. I think that means different things to different people. That said, there are definitely things that the admissions offices need to do better, and scandals like this are completely unacceptable. But I think it’s just a conversation that continues to need to be had and I think the scandal has certainly made admissions offices have conversations right now. I remember in the admissions office we were constantly rethinking, how do we weigh X consideration versus Y, and it is something that is difficult, and unfortunately, I don’t think there is a straight answer. In the debate over affirmative action, many students of color feel that they have had to defend their spots, but now parents have bought spots. What would you say to those students? Susan: It’s not easy. They definitely have been put in a very difficult spot. But I think I would also say that the scandal has been unfortunate, but it’s put into question the entire process. It’s completely wrong, but I think those cases are still the minority. I think the vast majority of students are getting in based on their merit, based on their academic performance, and their contributions to the community. As terrible as the scandals have been, I don’t think that’s reflective of the vast majority of the student body. Do you think the admissions process is going to change in light of this scandal? If yes, how so? Susan: I think certainly there will be a lot more scrutiny on the athletics process. For instance, maybe tracking the students who had been flagged for recruited athlete consideration and double checking they have some level of credibility. For instance, verifying that they actually do play that sport, maybe through a simple Google search. It’s hard because the officer is not going to be a sports expert. They can double check if the applicant has a track record out there. Then also following through on the back end - did the student end up joining the soccer team? I think just putting quality assurance into the athletics process is something I can see changing, and maybe making some extra steps and adding additional reviewers in terms of how either the lists are put together or how they are evaluated in the context of the admissions process. What would you recommend to students and families who are preparing to navigate the college admissions process? Where do we move forward from here? Susan: I think that you need to go in with eyes wide open. It is a complicated process. Even at InGenius when we work with students, I’m always amazed like, oh my gosh all these different schools have different requirements, different deadlines, there’s all these nuances. It’s hard and I think at InGenius we take great pride and care that we work with students and their families to navigate the system, but I also recognize that certainly there’s a lot of people who cannot afford these types of services. So in that respect, one of the biggest things I can say is try to be organized early, as organized as possible. Set up an Excel spreadsheet, list out practically all the schools you’re thinking of, all their different requirements and deadlines. I think one of the biggest parts is being able to track the vast amount of complicated information. The last thing I should say is, be selective. There’s so many great schools in the US, and it’s not like Yale is the end all be all, or Stanford is the end all be all. There are so many great schools, and if you’re somebody who is taking advantage of the resources that you’re given, whether you end up at a campus such as Yale or elsewhere, you will be successful. At InGenius Prep, we hold ourselves to a high ethical standard. We think it is important to think critically about how the college application process continues to evolve. Our counselors work hard to help our students take initiatives to stand out as leaders, make impacts in their communities, and share their hard-earned achievements in their college applications. Read more about our ethics and stance on the recent scandal here.